The ombre satin underlay of this gown from Macy's reminds me of an African sunset, and the subtle silver zebra stripes pay homage to the Zoolala theme without screaming animal print. Four legged wild beasts of the eqqus variety ruled my weekend (Nerd Note: Scrabble should have two "q" tiles - eqqus would make an excellent Scrabble word). Sunday belonged to Peyton and the Broncos, but Saturday was all about zebras at Zoolala, the Indy Zoo Council's annual fundraiser at White River Gardens. 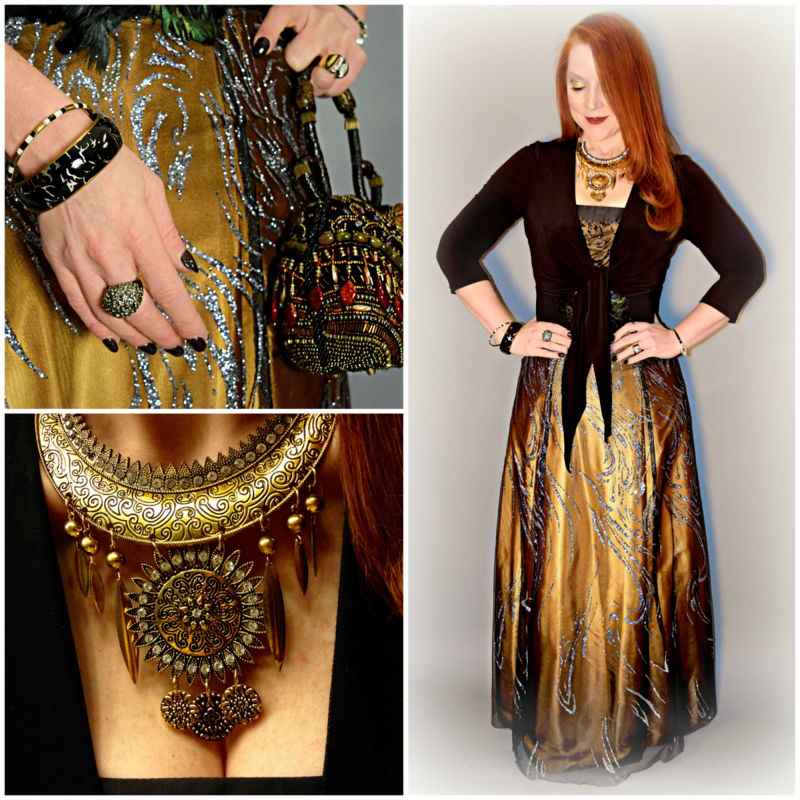 A lacquered wood bangle painted with silver zebra stripes was a $4 consignment store find; The brass and crystal statement necklace was a gift from my Mom two years ago. I was excited for the perfect opportunity to wear it. Thanks, Mom! This year's theme was "Amazing Africa." 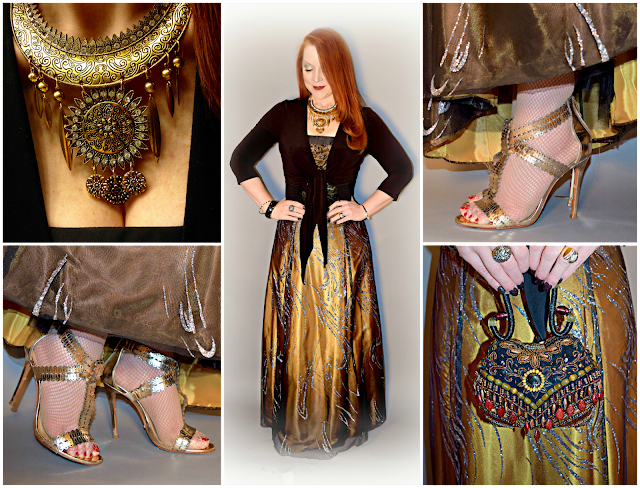 Though the attire was simply "black tie optional," you know how hard it is for me to resist a nod to the theme of an evening, and it was easy enough to do using pieces that were already in my wardrobe and a $4 consignment store purchase. 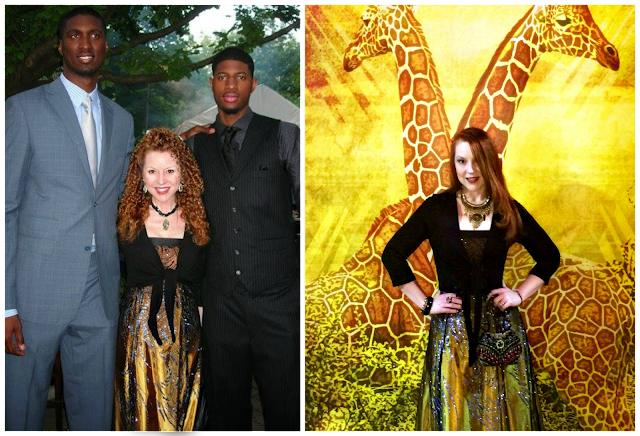 I wore this gown to Zoobilation (a different zoo fundraiser) in 2011 (left), with a druzy necklace and really big hair; I couldn't help noticing the parallel between the old photo with Indiana Pacers Roy Hibbert and Paul George and a snapshot from Saturday night's Zoolala with a couple of gorgeous towering giraffes as a backdrop! 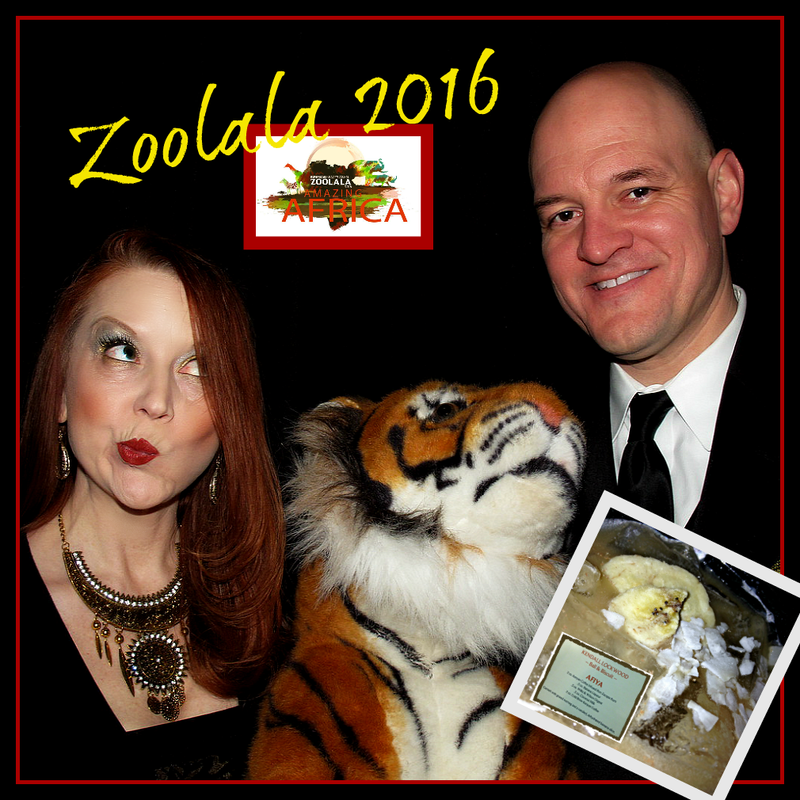 In fact, I took advantage of the opportunity to recycle a subtle silver zebra striped and ombre satin gown that I hadn't worn since 2011 (to a different zoo fundraiser where animal print attire was de rigueur). I laughed a little when I pulled out an old photo from the prior event. Holy cow (or zebra), my hair was MUCH bigger five years ago! An intricately beaded evening bag I picked up at a bazaar a few years ago adds another textural dimension to the ensemble and, more importantly, is large enough to hold essentials and fits over my wrist so that I can eat and drink without having to juggle a handbag, too. 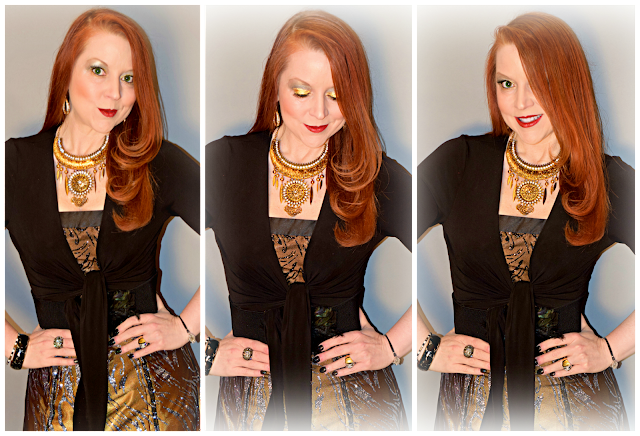 I also wanted to evoke the African theme of the night in my jewelry, and a brass and crystal statement necklace (a birthday gift from my Mom two years ago), was the perfect tribal-themed accent. Add to that a $4 set of zebra striped wood bangles from local consignment store Simply Chic and I was good to go. 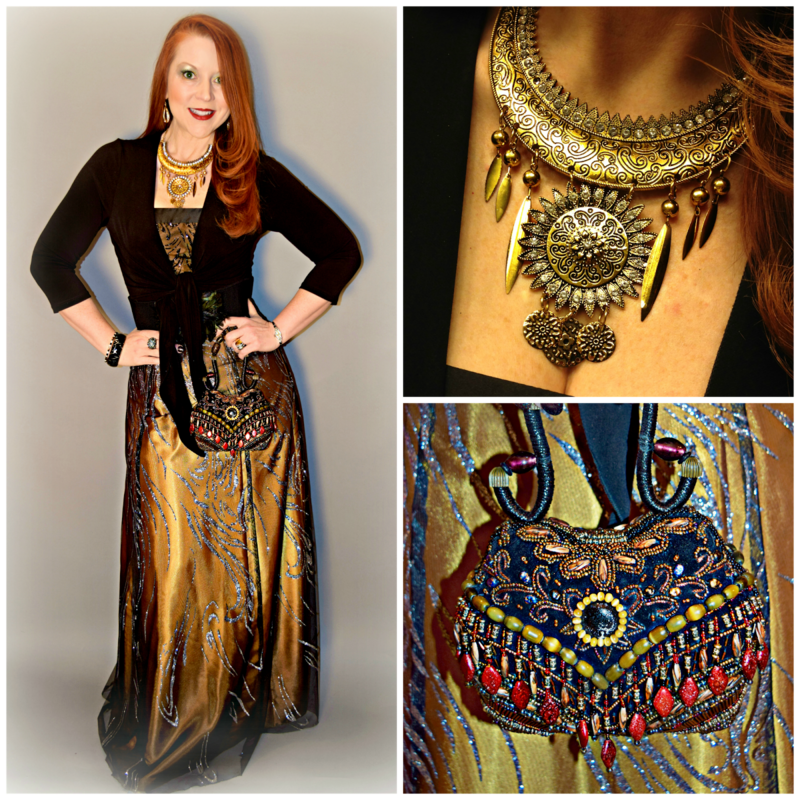 I go to a fair number of events that call for formal or cocktail attire, and while I love shopping for a new dress, I actually get just as much pleasure out of finding a new way to wear something I already own and love (not to mention the fashion budget benefits). Moreover, when you're wearing a dress that's five years old, the chances are exponentially greater that no one else will show up in the same thing, and that's just how I like it. Though mostly hidden under the long gown, I love these gold leather sandals by Schutz (Zappos).